The Payroll Postcard Samples on this page can provide ideas and inspiration for your practice. Whether you do payroll preparation or are full service payroll company, our coaches can help you design the perfect postcard that will generate payroll prospects. 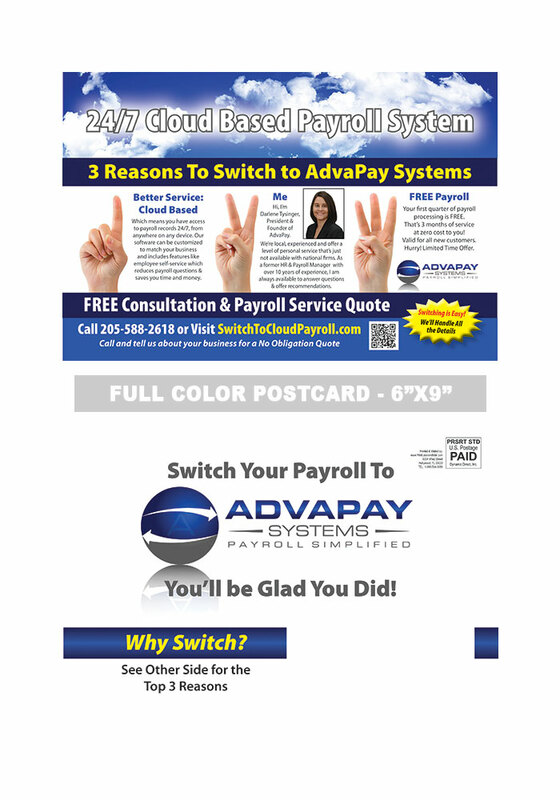 Check out our payroll postcard samples but remember, all of our postcards are custom designed. We provide a “No Risk” Design Guarantee. After we send your initial payroll postcard proof, you can make as many changes as you like (without charge) until you are completely satisfied. A revised postcard proof is sent after each change. Our bulk mailing postcards come in different sizes: 4″x 6″– 6″x 9″ – 8.5″x 7″and 6″x 11″. Our Direct Mail Postcards for Payroll businesses are UV Coated and are printed on premium 14-point card stock creating a professional piece that looks and feels first rate. Our full color Payroll Postcards are perfect for including photos of your payroll preparation business. Start with photos of yourself and members of your team. Also list your services on the postcard. To attract new clients you need to include a strong incentive on your bulk mail payroll postcard. Remember not to measure the success of your campaign by only a clients’ transaction, but rather by the amount of future business he will generate in the future and referrals he may send to you. Want a second opinion on the special offers you plan to include on your payroll postcard? Have a question about one of the Payroll Postcard Samples shown? Give us a call at 866-594-3069 and speak directly to one of our coaches for a free postcard design consultation.